Israeli couscous is one of my favorite grains for a few reasons – it’s incredibly quick (coming together in less than 15 minutes), it has a unique, fun texture, and it’s almost impossible to mess up. For those of you that are like me and constantly fight for rice to be fluffy but not-to-wet and soggy, Israeli couscous might be here just in time to save the day. The special part about this grain is that it behaves more like pasta than anything else, so it will maintain its texture no matter how much water you add. Just be sure not to overcook it! 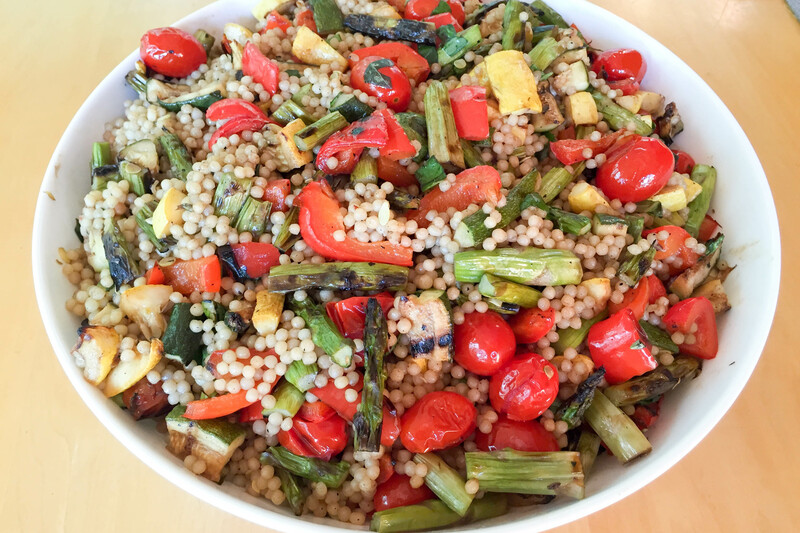 In this dish, Israeli couscous is mixed with all of my favorite vegetables, cooked somewhat painstakingly over the grill until just tender. The key to easing the grill process here is to quarter the vegetables and cook them in large chunks, dicing them up for the salad later. This makes the vegetables easier to turn over, and drastically reduces the number of vegetables sacrificed to the hot coals. This recipe is very flexible, and different ingredients can be swapped in and out depending on what you have on hand. Don’t like asparagus? Try eggplant instead. Like onions? Go ahead and throw them in. I encourage you to use your creative license here to make this dish your own! In a small bowl, whisk together the vinaigrette ingredients. Add a generous amount of salt and pepper, as this will be your main source of seasoning in the recipe. Cut all veggies according to the directions and add them to a large bowl. Pour half of the dressing on top. Let veggies marinade for ~15 minutes, if time allows. Remove veggies from the marinade and place carefully on the grill. Cook veggies until just tender, and remove from the grill. Cook cherry tomatoes in a grill pan designed for outdoor grilling (or use something similar, depending on what you have available). Make couscous: Add broth and water to a stockpot and bring to a boil. Pour in couscous and cover; let simmer for about 10 minutes, or until couscous appears tender but retains its texture. Once veggies have cooled, cut them into 1/2 inch chunks and toss into the couscous. Add remaining vinaigrette slowly, until salad is sufficiently dressed (based on your taste).